The Silurian Period follows the Ordovician Period in the Paleozoic Era. It began around 443 million years ago and lasted for 26 million years. Like the periods that have come before, it is named for an ancient Celtic tribe that lived in Wales where the geologic evidence was found. The climate was much warmer during the Silurian Period. This caused the glaciers to melt and the seas to rise. Even though the sea level was rising, there were places where the land was slowly rising as well. This was due to mountain building as the continental plates collided. In these places the seas moved away from the coasts or evaporated from the shallow areas. This left salt deposits. Plants that had lived in the coastal water had to adapt to life on land or die. Gondwana was still located in the southern hemisphere, but it stretched from the Equator, where modern-day Australia was located, to the South Pole, where modern South America was located. The tectonic plate that contained North America was moving toward the southeast. By the end of this period it would collide with another plate and form a mountain range. Most of North America was covered by shallow seas during this time. Of course, the warm shallow seas made good conditions for marine life to grow. The species that survived the mass extinction at the end of the Ordovician Period branched out and developed new variations. Among these survivors were the nautiloids, brachiopods, bryozoans and crinoids. Crinoids were filter feeding echinoderms that grew on long stalks attached to the sea bottom. They looked like flowers floating in the water. The long feathery arms caught the food for the crinoid. Cephalopods were smaller and there were fewer of them than during the Ordovician Period. 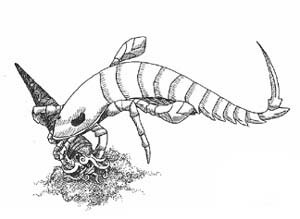 The Eurypterids or Sea Scorpions, made their first appearance in the Ordovician Period. In the Silurian they became the dominant predator. Eurypterids were arthropods. Arthropods have an exoskeleton and jointed legs. Crabs, insects, and spiders are all arthropods. One of the Sea Scorpions of the Silurian grew to be ten feet long. It was a huge predator that had large claws for snagging its prey. The new life in the Silurian Period was the coral reef. Tabulate corals and rugose corals formed these reefs in the Silurian rocks. Tabulate corals lived in colonies that formed chains. The chains sometimes looked like clumps of organ pipes. Rugose corals are often called horn corals because their shape looks like the horn of a bull. The tentacles of the animal reached out the top of the cup. The huge reefs made great hiding places for the new animal that lived in the ocean: the fish. Fish were a growing in importance during the Silurian Period. At the beginning, most of the fish were jawless. These were some of the earliest vertebrates, animals with a soft cartilage backbone. 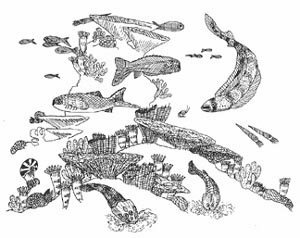 By the end of the Silurian many fish with jaws and real bones were swimming in the waters. These animals would soon rule the seas! Mosses and other primitive plants grew over the land near the water’s edge. They continued the work of the lichen turning the rock into soil. There are a few fossils from the end of the Silurian Period that show us early insects lived among these mosses and made their own colonies. The soil made by the lichens grew strange plants called Cooksonia. These plants had stems, but no real leaves. 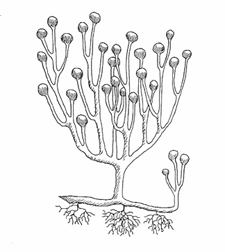 Some Cooksonia had special tissues for carrying water and nutrients upward to the branching parts of the plant. This vascular tissue is common in modern plants, but was a first during the Silurian Period.